It is an ambitious project, to chart the character of the human race. Its scope is vast, and the results are yet patchy—like a crude map which has great holes in it—a few towns perhaps being drawn in greater detail, and a few favourite walks in the woods. “These are early days,” writes Christian Miller — and here we find both the greatest strength and the greatest weakness of the book. For one man to have drawn this map (with frequent acknowledgement of his colleagues) is a major achievement. It is no mean author who can combine such scope with such detail. To have had the courage to do so at all has to be admired. There surely was no other way to do it—yet at the same time, the book is filled with admissions of the limitations, both of the author and of the research. Much of the evidence is “merely correlational”, writes Miller. “I can only register my own personal opinion.” “I wish I knew the answer.” “We need to gather a lot more data.” His greatest regret is that longitudinal studies are “almost non-existent” in psychology today—which is observational research in which data is gathered for the same subjects repeatedly over a period of time. Call it “diachronic” research, which may stretch over years or decades. It is not enough merely to have snapshots of how people behave. The Character Gap (subtitle: “How Good Are We?”) represents the first major popularisation of research which, until now, has been fairly much scattered about in academic papers. 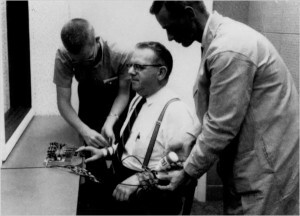 While some of these papers have come to the public’s attention—the Milgram experiment that revealed an alarming preparedness of people to do evil under orders, for instance—the wider implications of such research have been far from clear. The Character Gap represents the cumulative findings to date—backed by millions of dollars of funding through the John Templeton Foundation, a philanthropic organisation with a spiritual inclination that funds inter-disciplinary research about human purpose and ultimate reality. Most of us, says Miller, tend to think of ourselves, our friends, and our families as good people, but “such a picture of our character is badly mistaken.” Relentlessly, then, he pulls this picture apart—drawing on more than a hundred academic papers to prove it. We are capable of good; we are capable of evil. This we all know. Yet now we know that we generally choose neither, and little prevents us—by far the most of us—from behaving deplorably. And we do. What, then, is “character”? How does one begin to explore it? These are difficult questions, to which there are no definite answers. In fact, is it possible at all to quantify “how good” we are? Miller seems guided by much horse sense—yet it would be difficult to imagine how he could do otherwise, in a nascent field of psychology. He decides, “There is broad agreement today about most of the virtues and vices,” and with that he rests content. This is not to say that the book is simplistic, or ill-considered. Miller is aware of his lack of firm ground—but to accept this, it seems, is a necessary evil for the purpose of getting on. • Where participants heard a woman screaming in pain in an adjacent room, 93% ignored her. • Where subjects were ordered to shock a man (as best they knew) to death, 72% obeyed (the Milgram experiment). • Where respondents were asked to report on their behaviour over seven days, 91% stated that they lied. • Where students (without supervision) were asked to put down their pens at the end of an exam, 71% cheated—and not just “a little bit”. However, the book is not all bad news. There is at the same time a different side to the story. Take the first example above, of the woman who screams in pain. While 93% ignored her screams where they were in the company of an apathetic confederate, given the chance to respond alone, 70% helped her. Take the fourth example, of students who cheated on an exam. While 71% cheated in a typical classroom situation, 93% were perfectly honest when seated in front of a mirror. This introduces another major aspect of the book—the factors which may influence our virtues and vices. Here, too, we may throw away past assumptions. Above all, we may discard the notion that there typically are sound reasons—at least explicable ones—for what we do, whether good or evil. While in many cases there are, our behaviour may often change wantonly, capriciously, for the flimsiest of reasons—if we should know the reasons at all. For instance, the smell of cookies and cinnamon rolls made a group of men 105% more likely to do a good turn—and women even more so. Or having the choice to opt out, rather than in, increased participation in a retirement plan by 51%. We are greatly affected by “trivial influences”, writes Miller. These include temperature, noise, even ions in the air. • There are many situations in life where most people will demonstrate the finest forms of moral behaviour. • There are many other situations where most people will exhibit the worst forms of ethical behaviour. • Our changing moral behaviour is extremely sensitive to features of our environment, and often we do not even realise what those features are. • turning to divine assistance (which is, religion). One particular strategy seems to illustrate as much about the author as it does about the strategy. The research shows that, if we believe we are virtuous, we shall be more virtuous—but only as long as we believe it. For instance, when one experiment put a “charitable label” on people, they were 71% more likely to donate to charity. We could, therefore, lead people to believe that they are virtuous. Yet in order to do so, we would have to deceive. And what if we were found out? The book is filled with such nuances which, while they do not always provide answers, give interesting insight and useful pointers for future research. There were a few things I missed myself in the book, which could have been profitably explored. Above all, there was little if any consideration of government policy, or the influence of legislation on the virtues and vices—yet Miller explored many issues which would intersect with the same: penalties, rewards, conditioning, nudging, and freedom of religion, among other things. Given our new understanding of human character, how may government influence behaviour which is beneficial to all? On the other hand, what is it that happens when disorder and vice are unleashed in society? And how would a government itself be virtuous—if this should ever be possible? I missed something, too, in Miller’s treatment of religion. While he readily confesses that he may have Western biases—his research being largely confined to North America and Europe—there was a big theological gap which would seem to have a material bearing on the book. One believes in a cosmic God; one believes in a personal God. But there is, in the West, a weakness of belief in an interventionist God—much weaker than one finds it in the (Abrahamic) Scriptures. It is described by “the flaw of the excluded middle”. If God should intervene in our reality, what bearing would this have on our moral actions? If one sees that outcomes are determined not so much by ourselves as by God, this should have a profound effect on our behaviour. There is, in my view, a simpler way. We know today that our visceral (“gut”) feelings are generated by novelty, discrepancy, and interruption—in each case, by a world which is not so arranged as we had anticipated. Even a dog, when faced with food it does not expect to see in its bowl, is visibly affected. The 20th century psychologist, Richard Gregory, describes it as encountering the “unexpected”—or, as his fellow American, the philosopher, Willard Quine, has it, “the expected which fails to happen”. In short, the arrangement of the world in our minds, when we hold this up against the world, has everything to do with emotion and motivation. Now consider that many people’s arrangement of the world in their minds is parochial, self-interested, or short-sighted. Miller shows us that a narrow focus on “techniques and devices” morally diminishes us, while “perspective-taking” profoundly influences our behaviour for the good. In fact, in each of the four areas of character which he surveys, our behaviour worsens where our perspective narrows. With this in mind, it is a partial or fragmented view of our world which causes us to act in strange ways. The remedy then is clear: rather than “monitoring ourselves constantly”, we may both develop and teach a more holistic view of the world. Virtue would, we suppose, be a by-product of the same. The Character Gap marks a great shift in thinking—perhaps on a par with the discovery, more than a century ago, that a large part of our thinking was unconscious or unawares. To put it too simply, this implied not only that our very own thoughts might lie beyond our control, but that we might not be fully in command of our moral judgement. Contradicting everything we thought about ourselves, it came as a great shock at the time, and had a major influence on the century which followed. It is impossible to say whether the research presented in this book will have the same kind of impact on coming generations as the issue of the unconscious did—but if it does, it would be no surprise to me. Miller himself commends the work as “extremely important” and actually, by the end of his account, I am persuaded that it is. Once the genie is out of the bottle, it cannot be put back. While Miller himself seems optimistic as to the good that this research will do, and fairly confident about the direction things will take, I think there is no telling. Not least, given the fact that our moral behaviour deteriorates where we fail to think of ourselves as virtuous, it seems possible to me that the book might have the opposite effect. The Philosopher's verdict: Glimmers of hope in the search for goodness. Heroism is the exception not the rule. This shouldn't be that surprising. I think the only reason why anyone would be surprised at these findings is down to a century of flattery by politicians who want our votes and salesmen who want our money. Even so Schamlippenverkleinerung, this is certainly perceived quite diversely and can sometimes be quite distressing, in spite of painkillers which we recommend for you. This can be over after the very first nighttime or at best drastically much better, usually. About the initially postoperative day, a wound handle using a dressing up transform happens within our exercise.